So, there have been lots of feelings seeping into the blog recently. I’ve experienced God in a new way, and have been expressing myself through blogs that have often felt uncomfortable for me. But nothing. NOTHING is as uncomfortable as the encounter I had with my very favorite author, Jen Hatmaker. Before I tell this story, there are two very important things you need to know about me. One: I am painfully shy. Normally, I would never approach someone and ask for a picture with them. I might take a picture from afar, or say a short hello, but that’s it. Two: I love Peyton Manning. Not in a “he’s so cute” way, but in a “he’s really talented and awesome” way. I have a kid named Peyton. I’m a fan. Which brings me to my story…. Last Saturday, immediately after the IF:Gathering, I said goodbye to my new friends, and rushed to find the nearest restroom. I was in a hurry, y’all. Now, please keep in mind, that I had just experienced this ENTIRE weekend of “don’t be afraid,” and “be strong and courageous!” Plus, I’d just spent five minutes on my knees praying with Ann Voskamp, and I was emotional. No, I was a disaster. I knew there was a bathroom on the first floor, and that I could get to it pretty quickly, so I headed for it. When I was almost there, I saw a small group of people crowding around. Then I saw Ann Voskamp having her picture taken. I thought it was cool, but didn’t want to bother her for a picture, and she rounded the corner to go into some sort of green room. I continued past the crowd to what I thought was the bathroom, and instead was face-to-face with Jen Hatmaker. Jen is a Christian author who has written several books. Her family also starred in the HGTV series “My Big Family Renovation” last summer. When you read her books, it feels like you’re sitting down with a good friend who is being extremely honest with you about her faith—both good and bad. Her books have changed the way I view various aspects of my life and my relationship with Jesus. And that was it. You GUYS… I just can’t. I don’t even remember if I said thank you or not. I’m just glad she didn’t file a restraining order against the crazy lady who called her Peyton Manning! 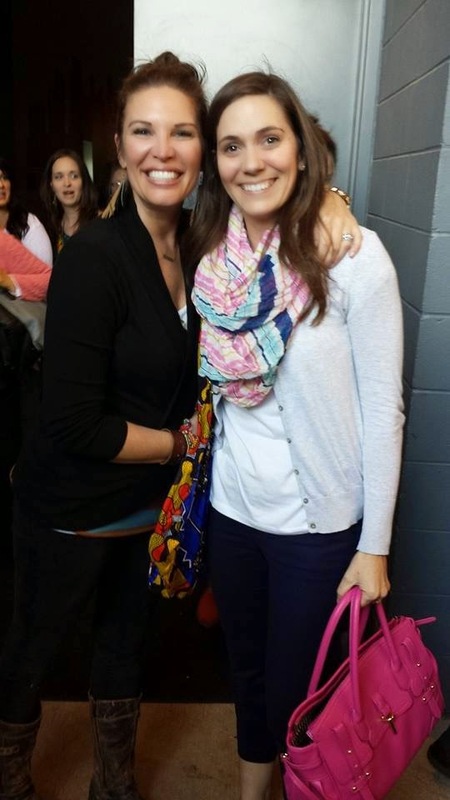 So, my first brave IF act, was to ask Jen Hatmaker to take a picture with me. Do I wish I would have done things much, much differently? YES! But I’m really glad I got to say hello. It’s not every day you get a chance to meet one of the people who has helped you in your walk. So, even if I die of embarrassment every time I look at this picture, I’m thankful I had the courage to ask to have it taken. And that Jen didn’t have me immediately arrested. Is she not adorable? And I'm a hot mess!